Fish out of water! Grunion have a unique mating behavior of spawning on sandy beaches in southern California at very high tides, out of water. Females swim as far up on the beach as possible and dig a hole in the sand by wiggling their tails back and forth, and release their eggs. Males follow and fertilize the eggs. The eggs then remain buried in the sand until they hatch during the next tide that is high enough to reach them, usually 10 or more days later! Tourist attraction! 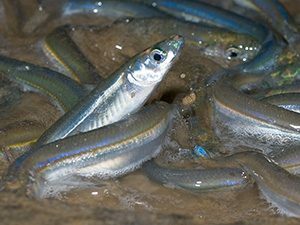 Countless people flock to southern California beaches each spring and summer on a few select nights for a chance to view this unusual mating behavior, known as the “grunion run”. Despite these local concentrations, grunion are not very abundant and spawning behavior may be further threatened by beach erosion, harbor construction and pollution. Grunion may only be collected by hand and the season is closed during April and May to protect the mating season. Grunions are a short-lived species with few individuals living past 3 years of age.